Shelby County has an ample supply of existing housing for the current population. There are private sub-divisions in three of our communities and Harlan has a sub-division owned by the City of Harlan to accommodate future population growth. The existing homes offer a very nice variety of styles, location, and price ranges. The location ranges from properties in the city limits plus rural residential and acreages. The housing market has not had a big fluctuation in prices over the past 3-4 years like other parts of the country. The market has been consistent with prices and transactions remaining constant. The City of Harlan participated in four housing rehabilitation programs over the past 10 years. The result is that over 50 older homes have improved aesthetics and energy efficiency. New construction lots are available throughout the county. Ten new condos were constructed in the last few years. Six lots remain available in two development sites. The City of Harlan is actively marketing available lots in its G.H. Christiansen subdivision in north Harlan, and recently has put together a marketing packet of information for anyone interested in building a home in the community’s newest subdivision. In recent months six lots have been sold for four different housing developments in the subdivision. Lots are available for only $1,000 each, officials said, making it an attractive area for new construction. Although the lots have been available for the past few years, the city is making a more concerted effort this fall and winter to let the public know there are many building lots available for future construction. A plat of the lots in the subdivision identifying the lots available for sale. There is is also a large sign on the lots on the corner of 12th and Dye Streets in north Harlan. Covenents which provide quidelines on purchase, constructioin, and residing in the area. 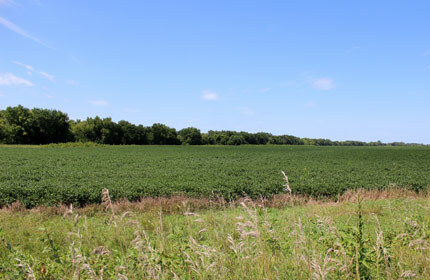 ​In addition, officials said the USDA Rural Development has a single family housing loan program which may provide direct loans and loan guarantees to build a new home. Contact the Atlantic USDA Rural Development office at 712-243-2107 ext. 4 for more information. “Once you make an offer to purchase you can expect the city council to act on your offer in at least two city council meetings, which may take 30-45 days,” officials said. “This is part of a normal process to sell and dispose of publicly owned property. A new housing addition in northwest Panama has 12 new homes and another 12 choice building lots available. These sites have great yard space for children with new streets, gutter, utility connections, etc. Hawthorne Hills is a new sub-division located ¾ mile north of Interstate 80. There are four constructed homes and another 10 lots available in the first phase of development.